I remember when I first started working in the tech industry nearly 35 years ago on the manufacturer side (I had been involved as a user before that). This was the early 1980’s, and I was intrigued by programs at Apple and Intel that offered their employees sabbaticals after a prescribed number (usually seven) years of service, giving them some unstructured time away to clear the head and explore new thoughts. I liked this idea of time to refresh and redirect, but my employer at the time, Hewlett-Packard, though known for being quite progressive with respect to employee programs (they invented the Beer Bust after all), never saw it fit to offer sabbaticals. Also, I got curious about a ministerial sabbatical program when I was on my church board of directors. (Beyond sabbaticals for clergy, of course they may be most well known in academia.) Just finding out where that word and concept came from was fascinating and in retrospect should have been somewhat obvious. Of course the idea of the “resting on the seventh day” is prominent in the beginning of the book of Genesis, and a more applied approach was crop rotation, known among ancient agriculturists to be a good idea — letting the land “rest” after a number of years of planting resulted in a higher yield and more prosperous times for all in the long run. I worked continuously for HP from 1981 through 2005, and never had a real break other than typical vacation times. And when starting a second career after that, I followed some good advice to not let the “trail get cold.” While many colleagues would build in a three, six or even 12 month “cooling off period” before starting something new, it made sense to me that all my contacts and knowledge would be the freshest immediately after leaving corporate life, so in addition to getting some immediate consulting work, my first Jim Lyons Observations monthly musings appeared before the end of 2005, and I have been cranking them out ever since. But now I'm taking a break. This will be my last one for a while. 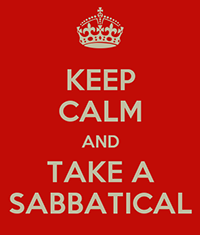 I finally decided it is time for that sabbatical, after 34 years working in the tech industry. I'll continue to teach but that's far from a full-time endeavor (and not intended to be) and a couple of weeks in, so far I'm having a blast! I'm not worrying so much, if at all, about printer industry issues, but I am enjoying becoming engaged in some broader tech subjects and even community projects. As luck would have it, I was asked by a colleague to attend a local city library planning meeting she was facilitating. And guess what? 3D printing came up as a vital part of the “maker space” concept under the purview of many in the meeting, including the library. So who knows? Maybe, as the saying goes, the apple won’t fall too far from the tree. But for now, I thank my many readers over the years, and ask that you not forget about Jim Lyons Observations, even if we go dark for a bit. I made it from 2005 to 2015 putting out monthly posts, and intend to be back renewed, refreshed, and with some newfound interests! This past Thursday, I dropped in on the Boise Public Library's "3D Thursday". It was fun to be there (with a Mechanical Engineer friend) and see who else was interested. Just two days later, the local newspaper ran a story, "Library's 3-D printers popular to check out". Now to actually "print" something! As we head into the NFL's Conference Championship weekend, there might be a few readers out there who recognize "the party's over" reference to an old Monday Night Football tradition carried out by the late Don Meredith, who shared the broadcast booth for many years with Frank Gifford and Howard Cosell. When the game was judged by Meredith to no longer be in play, he would start to sing the song, symbolizing the game was out of reach for the losing opponent. In the case of Google Glass, the "song" really started last year, and this week's announcement that the Explorer Edition was being discontinued was the equivalent to the final whistle with related organizational news from Google a bit of a "wait til next year" refrain. So we'll see - but so far the Explorer Community's official community site (screen shot above) reflects some confusion and bitterness.